Manuel Álvarez Tardío is Senior Lecturer in the History of Political Thought and Social and Political Movements at Rey Juan Carlos University of Madrid (Spain). Author or co-author of El camino a la democracia en España. 1931 y 1978 (Madrid, Gota a Gota, 2005); The Spanish Second Republic Revisited (Brighton, Sussex Academic Press, 2012); Políticas del odio. Violencia y crisis en las democracias de entreguerras (Madrid, Tecnos, 2017); and 1936. Fraude y violencia en las elecciones del Frente Popular (Madrid, Espasa, 2017). José María Gil-Robles (1898–1980) was one of the major protagonists of twentieth-century Spanish politics. He founded the CEDA, the first modern party of the Spanish right, and did so during the Second Republic of 1931–36, at a critical moment for conservative Catholics opposed to several aspects of the new constitution. He sought to create a new legalist, possibilist right-wing movement that could win at the ballot box and demonstrate its strength in parliament. He achieved a great electoral victory in November 1933, but did not succeed in becoming prime minister. The left considered him a danger to the republican regime. In July 1936, after another election and a tense spring, there was an attempted coup d’état, and the Civil War began. This brought a definitive end to party politics and, therefore, to the experience of the CEDA. From that point Gil-Robles lived in Portugal, and did not return to Spain until the 1950s. He supported the Allies during the Second World War, and argued for the restoration of the Spanish monarchy. He also played an important role in inspiring new movements for Christian Democracy. This book is an account of the “republican” period in the life of Gil-Robles. It is the first thoroughly-researched biography that examines in a balanced, well-documented manner the paramount, though still problematic, contribution he made to the democratization of Spanish conservative politics. It responds to certain crucial questions as to why the CEDA was unsuccessful, and what were the obstacles that it encountered in its attempts to amend the republican system. Equally, it also analyses the manner in which Gil-Robles led the forces of conservatism, one based on tenets that were clearly distant from fascism but equally opposed both to Marxism and liberal individualism. 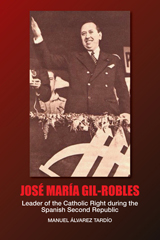 This career biography of Jos<’e> Mar<’i>a Gil-Robles, founder of Spain’s first modern right-wing party in 1933, centers on his contribution to the democratization of Spanish conservative politics in the 1930s. Looking at the impact of Spain’s Second Republic, the book investigates why the Spanish Confederation of Autonomous Right-wing Groups (CEDA) was unsuccessful.